St Kitts and Nevis are known for their luxury relaxing lifestyle and when it comes to dining out, it is hard to beat the upmarket cuisine or relaxed beach bars the islands offer. 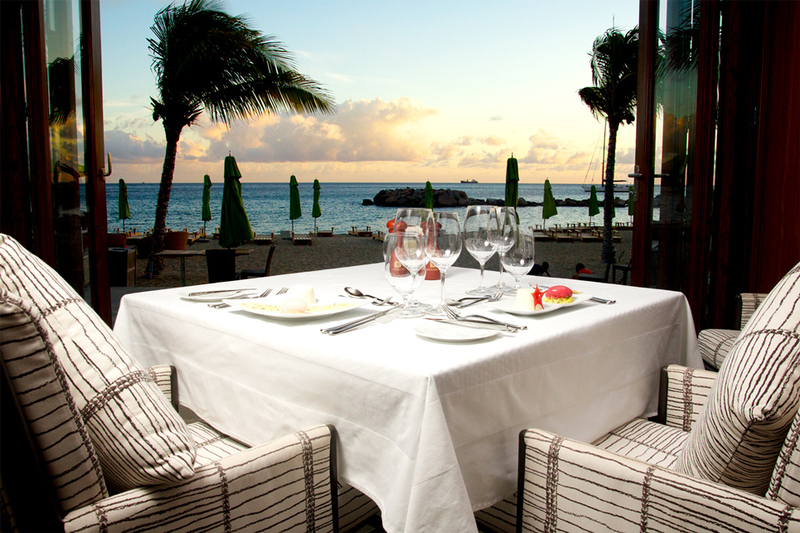 From Stylish restaurants and eateries around the islands to beach cafes and snack bars, well you just can't beat it. 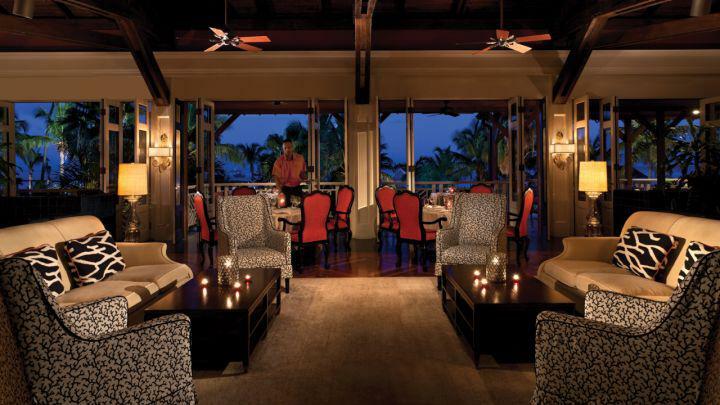 Many of the hotels have fine dining offring tourist and islanders a Caribbean taste when perusing the menu. Whichever typ of food or snack is your choice, you can be sure there will be a restaurant close to tempt those taste buds! If you have special place you like to dine or enjoy a snack not listed, we would love to hear about them. Simply write to us at info@coldwellbankerstkittsnevis.com and tell us, we will be happy to add it to our growing entertainment guide for Aruba. This stylish restaurant sits on friars Bay, it has a beautiful beach front setting with indulgent white tents and beach beds which are perfect for a casual lunch. Evenings here are truly spectacular offering diners beautiful views and outdoor fiber-optic fountains and a superbly decorated interior complete with eat-in wine cellar, exhibition kitchen and sushi bar. Seafood such as red snapper is a favorite dish as is the full flavored butternut squash ravioli and the spicy kittitian roll. Reservations are essential at this restaurant to avoid any disappointment. 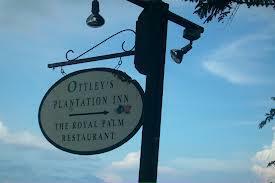 The Royal Palm is situated at Ottley's Plantation which has been converted into a semi-enclosed lounge with beautiful sea views and a patio that is perfect for dining al-fresco. You can choose from 3 course menus and an a la carte menu for a delicious blend of indigenous ingredients together with Asian, Mediterranean and latin influences. 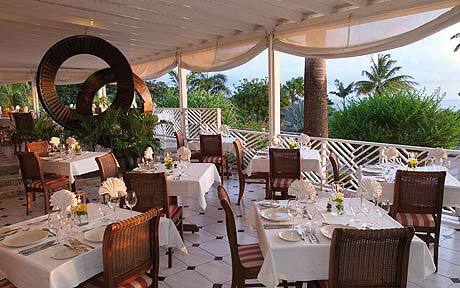 The combination of mouthwatering food, great presentation and wonderful romantic setting at Royal Palm is unrivaled. This is a beautiful beachfront restaurant serving delicious food with the perfect mix of African, French, English, Iberian, Asian and Dutch influences. The restaurant always sources local ingredients from Kittian farmers and fishermen and it is not unusual to see one of those fishermen arrive at the restaurant with snapper that he has just caught! The restaurant is open daily serving light snacks, lunch and evening meals. Coral Grill is a beautifully decorated restaurant that offers delicious fresh seafood, beautiful meat dishes and a comprehensive wine list. The restaurant is situated upstairs in the Great House of the Four Seasons and provides diners with a wonderful view of the Caribbean sea. The hotel can arrange a unique dive and dine experience where you will plunge deep into the sea to catch your own lobster or other marine creatures that the chefs will prepare for you. As you approach this historic sugar mill and ascend the cobblestone steps illuminated by torches you will feel the stylish ambiance of this restaurant. Drinks and canapes are served in the relaxing bar before dinner is served on the terrace which has enchanting views of Charlestown and nearby St Kitts. The cuisine at Montpellier is light and modern and has been perfected with the use of local ingredients, herbs and spices, the menu is varied offering a choice of fresh seafood, meats and vegetarian options.